We’d love your help. Let us know what’s wrong with this preview of Debtors' Prison by Robert Kuttner. One of our foremost economic thinkers challenges a cherished tenet of today’s financial orthodoxy: that spending less, refusing to forgive debt, and shrinking government—“austerity”—is the solution to a persisting economic crisis like ours or Europe’s, now in its fifth year. Since the collapse of September 2008, the conversation about economic recovery has centered on the One of our foremost economic thinkers challenges a cherished tenet of today’s financial orthodoxy: that spending less, refusing to forgive debt, and shrinking government—“austerity”—is the solution to a persisting economic crisis like ours or Europe’s, now in its fifth year. Since the collapse of September 2008, the conversation about economic recovery has centered on the question of debt: whether we have too much of it, whose debt to forgive, and how to cut the deficit. These questions dominated the sound bites of the 2012 U.S. presidential election, the fiscal-cliff debates, and the perverse policies of the European Union. Robert Kuttner makes the most powerful argument to date that these are the wrong questions and that austerity is the wrong answer. Blending economics with historical contrasts of effective debt relief and punitive debt enforcement, he makes clear that universal belt-tightening, as a prescription for recession, defies economic logic. And while the public debt gets most of the attention, it is private debts that crashed the economy and are sandbagging the recovery—mortgages, student loans, consumer borrowing to make up for lagging wages, speculative shortfalls incurred by banks. As Kuttner observes, corporations get to use bankruptcy to walk away from debts. Homeowners and small nations don’t. Thus, we need more public borrowing and investment to revive a depressed economy, and more forgiveness and reform of the overhang of past debts. To ask other readers questions about Debtors' Prison, please sign up. Since well before the 2008 financial crisis, the practice of economic austerity has beleaguered American and European politics. Praised by the right as a panacea of renewed financial responsibility, and decried by the left as a mechanism for dismantling the West’s already struggling middle classes, austerity signifies a critical juncture where battered economies face radically different strategies for picking up the pieces. Robert Kuttner’s Debtors’ Prison: The Politics of Austerity Versus Possi Since well before the 2008 financial crisis, the practice of economic austerity has beleaguered American and European politics. Praised by the right as a panacea of renewed financial responsibility, and decried by the left as a mechanism for dismantling the West’s already struggling middle classes, austerity signifies a critical juncture where battered economies face radically different strategies for picking up the pieces. Robert Kuttner’s Debtors’ Prison: The Politics of Austerity Versus Possibility is a plangent polemic that deconstructs and rejects the political ideology behind the austerity model. Kuttner is an undeniably partisan force, but he goes to great lengths to justify his biases. Presenting a view that is historically resonant and globally aware, Debtors’ Prison makes a convincing case that austerity policies lack the ability to revitalize our economies and to justly distribute economic prosperity throughout the Western world. Austerity policies have been the vanguard of the conservative agenda since Reagan’s election in 1980. According to Kuttner, these policies conflate “several kinds of debt, each with its own causes, consequences, and remedies. The reality is that public debt, financial industry debt, consumer debt, and debt owed to foreign creditors are entirely different creatures” (19). Debunking the position that financial instability stems from overspending on programs like Medicare and Social Security, Kuttner claims that the real culprits are “two wars and gratuitous tax cuts for the wealthy,” “declining real wages,” states that “paid for tax cuts by reducing funding for public universities,” and several decades of financial deregulation that resulted in egregious financial industry debts incurred by “investment banks, hedge funds, commercial banks with ‘off-balance-sheet’ liabilities, and lightly regulated hybrids” (20-1, 23). This cesspool of war spending (much of which is pocketed by private contractors), unnecessary tax cuts, general divestment in the public sector, and indefensible banking is, frustratingly, the result of austerity as well as the justification for its continued use. When we systematically smother the ability of governing bodies to tackle big problems, the neoliberal narrative that “government is the problem” becomes a self-fulfilling prophecy. Turning austerity ideology on its head, Kuttner argues that reduced government spending is the worst possible response to economic distress, because beating a depression requires a massive increase of pubic investment in good jobs and basic infrastructure. This case has been made many times by numerous leftists and Keynesians, but Kuttner’s historical analysis is particularly powerful. The Great Depression and post-WWII economies in America and Europe show that a temporary increase of government debt is necessary to reboot a national economy, and that the proper time to address deficit reduction is after recovery (17). He also demonstrates that debt restructuring or outright forgiveness––for desperate nations as well as individuals––is often the most expedient way for both creditors and debtors to get back to business. While forgiveness for errant creditors (financial institutions) has been the historical norm, those same creditors hypocritically balk at the suggestion of taking a loss so an indebted country or citizen can rebound from financial ruin (Chapter 7). Although the Obama administration has not fully supplicated itself to austerity, Kuttner is highly critical of the President’s turn toward deficit reduction in lieu of infrastructure spending and job creation (62-3). In 2015, we can observe that while the economy has improved somewhat and unemployment has come down considerably (partly because citizens have given up looking for work), we still have not seen adequate growth in living wage jobs, a minimum wage increase, or an infrastructure bill that would truly end the Great Recession for those hit hardest by the crash. Kuttner admitted that the political will to make this happen was all but nonexistent in 2013, and the same seems true two years later. Regulatory capture and what Joseph Stiglitz has called “cognitive capture” of public officials is still the norm, and Kuttner’s recommendations are not driving the preliminary 2016 election rhetoric (the exception being that indomitable champion of socialist democracy, Bernie Sanders). Other questions compound our political malaise: How will technological unemployment affect the “green growth” revolution, and will the carbon emissions enabling that revolution spell game over for the climate? Do full-on globalization and technological acceleration constitute a genuine “it’s different this time” scenario where postwar strategies may not work as they once did (282)? With a revitalization of regulation and centralized spending, how can we minimize bureaucratic bloat and internal corruption? Irrespective of how we come to answer (or ignore) these questions, it’s clear that much is at stake in the next several decades of economic policy. The West’s continued prosperity is far from guaranteed, and Kuttner rightly warns that, “Unless the broader ideology of austerity for states and license for bankers is reversed, Europe will continue to lurch from crisis to crisis, and the Continent’s institutions will face a generation of lost prosperity and lost legitimacy for its democratic governing institutions” (169). I see no reason why the same logic would not apply in the United States. And it’s not as if there aren’t hungry and humming economies ready to supplant us: BRICS countries (Brazil, Russia, India, China, South Africa). While we should welcome the efforts of developing countries seeking to bring economic prosperity to huge populations, we don’t want their achievements to coincide with the deterioration of Western nations and institutions, or to preside over the final destruction of ecosystems the West has mistreated for centuries. The world won’t wait, and austerity has already cost us decades of progress. But we do not have to continue down this road. “We must begin,” Kuttner says, “by reclaiming democratic politics” (295). This excellent book is an exploration of the current economic idea that national debt reduction and austerity will help us find our way out of our ongoing economic malaise. The book is meaty, looking at historic examples of austerity as a means of approaching economic downturns, and comparing those times with times of great prosperity, particularly, for the USA, during the several decades following World War II. Although he uses examples from the history of many countries, including Asian and So This excellent book is an exploration of the current economic idea that national debt reduction and austerity will help us find our way out of our ongoing economic malaise. The book is meaty, looking at historic examples of austerity as a means of approaching economic downturns, and comparing those times with times of great prosperity, particularly, for the USA, during the several decades following World War II. Although he uses examples from the history of many countries, including Asian and South American countries, he especially focuses on the USA and Europe. There is a very interesting chapter on Greece, and how Germany's background has led to its weighty influence in determining Europe's approach to struggling countries like Greece. The author is very thorough and has about twenty pages of notes with references, for those who wish to dig deeper. It was interesting to me that the old adage, "ideas have consequences" , is born out by his examples. Lasissez-faire capitalism is the ascendent idea, and has been since the 1970s. Will an unregulated market lift all boats? We have been steadily deregulating for several decades. Some of the very complex financial arrangements that led to the collapse in 2008 were a result of deregulation. As Mr. Kuttner says on page 293: "A vastly simplified financial system whose purpose is to serve the rest of the economy should be the national policy goal. That would have the additional benefit of reducing the bankers' political power. " He also advises mortgage restructuring for those who now owe more than their home is worth, for debt reduction for students (such as erasing the debt after ten years of paying it down), and of work programs for rebuilding our infrastructure. I think a concerned citizen could not do better than to begin by reading this very informative book. In Malaysia, another small nation that had suffered the effects of currency speculation, Prime Minister Mahathir Mohamad rejected the advice of IMF and resorted to direct capital controls. This was ridiculed by Western experts as a mark of economic illiteracy, yet the strategy worked beautifully. The central bank used controls mainly to kill the offshore speculative market in Malaysia's currency, the ringgit. Outside Malaysia holders of the ringgit had to wait a year before converting the currency. Long term investment was still welcome. The above is possibly the most succinct of the multiple narratives in this book that begins with Daniel Defoe's attempts to abolish the literal debtors' prisons (he even drops a reference to Thomas Dekker's debtors' prison stay, whose The Roaring Girl I read early this year and contains many references to debtors' prison and footnotes describing in detail what they were like and how they differed based on social class) and compares them to the metaphoric debtors' prison of today, austerity, which accomplishes nothing but put more wealth in the hands of those who already have the most based on the lie that economic slumps are caused by deficit rather than debt. The Tea Party (see the extended quotation at https://scottandrewhutchins.wordpress... ) wants us to believe that poor people like me are at fault for the economic crash, not the billionaire gamblers ("speculators") that actually caused the crash. They claim that going to graduate school was "profligate spending" on my part, that I refuse to get a job, when I take any reasonable job offer for my medical condition, and that I am a leech on society by living in a homeless shelter. The Gramm-Leach-Bliley Act, the failure to regulate derivatives, and the fact that the recession of December 2007 and the crash of 2008 were all caused by private rather than public debt. Yet they, and the International Monetary Fund, which is performing a function diametrically opposed to what it was set up to do following World War II that stimulated the economy, is keeping nations, continents really, in economic slumps in order to redistribute wealth upward to billionaires, or, in Kuttner's words, the "rentier class." Before our figurative debtor’s prisons, and before literal debtor’s prisons, Kuttner tells us, there was indentured servitude, agreements that are now called “contracts of desperation” by legal scholars (10), not unlike contemporary student loan debt. “[A]fter a collapse, a debt overhang becomes a macroeconomic problem , not a personal or moral one. In a deflated economy, debt burdens undermine both debtors’ capacity to pay and their ability to pursue productive economic activity” (15). These concepts are beyond the ken of extreme right-wingers who tell the poor “Pay your debts!” as though it is a moral issue, while the wealthy discharge debts they run up all the time. They cry out for us to “live within our means,” regardless of whether doing so is actually feasible. Right-wingers’ demands (and those of the German Bundesbank) remind us of the pre-Depression lunacy of Andrew Mellon, who told President Hoover to “liquidate labor, liquidate farmers, liquidate real estate . . . it will purge the rottenness out of the system. People will work harder, live a more moral life” (quoted, 19). The real economy—as opposed to the financial one—needs cheap capital in order to grow. The lesson of the era of managed capitalism is that the economic sweet spot is the combination of plentiful credit and tight regulation, so that low interest rates finance mainly productive enterprise. The mistake of Federal Reserve chairman Alan Greenspan and chief economic advisors Robert Rubin and Lawrence Summers and others was not to loosen money; it was to loosen regulatory constraints on its speculative use. And this was no innocent technical mistake. It was the result of relentless industry pressure for deregulation coupled with the financial sector’s success in installing allies in key government posts, regardless of whether the administration was nominally Republican or Democrat…. “A mistaken premise is that high levels of public spending produce high deficits. But a government can have declining domestic spending and rising deficits, as Ronald Reagan showed… in a deflated economy, an increase in the short-term deficit to finance investment is better medicine than austerity” (29). The deficit hawks’ vision of the future if we do not cut deficits now is “just about backward. The well-being of our children and grandchildren in 2023 or 2033 is not a function of how much deficit reduction we target or enforce in this decade but of whether we get economic growth back on track. If we cut the deficit, reduce social spending, and tighten our belts as the deficit hawks recommend, we will condemn the economy to stagnant growth and flat or declining wages. That will indeed leave the next generation a lot poorer. The existing debt will loom larger relative to the size of the real economy, and there will be too few public funds to invest in the education, employment, job –training, and research outlays that our children and grandchildren need” (30). “With earnings so deeply depressed, the economy has no good substitute for that consumer borrowing. Public borrowing invested in new economic activity could play that role, but the conventional wisdom says public deficits need to shrink” (38). “In comparable conditions in the 1930s, the failure of low interest rates to end the Depression was likened to ‘pushing on a string.’ It was the wrong policy instrument, or at best not a sufficient one” (39-40). “'The Great Recession,'” Kuttner tells us, “is a misnomer. We should stop using it. Recessions are mild dips in the business cycle that are either self-correcting or soon cured by modest fiscal or monetary stimulus. Because of the continuing deflationary trap, it would be more accurate to call this decade’s stagnant economy The Lesser Depression or The Great Deflation” (40). Citing economist Andrew Sum, 83% of the growth in the real national income went to real corporate profits, the largest share “'by far in any of the six past recoveries and the largest in any national recession recovery since the official statistics start in 129'” (43, quoting Sum). Similarly, Kuttner quotes Sheila Bair on the total hypocrisy of this situation, “John Dugan famously said during one of my open FDIC meetings that small banks were failing and none of his big banks had failed. They didn’t fail because they were bailed out!” (48). The large passage quoted in my blog entry linked above describes why, for example, ShoreBank failed despite having been a responsible lender. Kuttner’s third chapter, “The Allure of Austerity,” starts by telling us about billionaire investment banker Peter G. Peterson, who warned that a crash would come due to budget deficits crowding out productive investment. The reality of the crash had everything to do with the lax financial regulations he promoted in four books and articles Kuttner describes as “jeremiads” that never mention the risks of financial speculation. While he says it would be wrong to single him out, he calls him “emblematic of a creditor class that has become increasingly dominant—hegemonic—in American fiscal politics” (51-52). Clinton and Greenspan struck a deal in 1993 to trade smaller deficits for lower interest rates. “The two policies had no logic connection, except in Alan Greenspan’s ideology. “Projected deficits were having no impact on interest rates,” thus making cutting the deficit a political rather than an economic imperative (55). Higher growth and reduced unemployment also increased payroll tax receipts and moved the Social Security accounts further into the black. Deficit hawks were fond of pointing to the estimates by the Social Security trustees projecting that at some point in the 2030s or early 2040s Social Security would not be able to meet all of its anticipated obligations. The 2012 Trustees’ report put the program’s long-term deficit at about 1 percent of GDP—something easily solved by modest tax increases on high-bracket wage earners, or better yet, by rising wages. That did not last. In the grip of the recession that George W. Bush started in December 2007, Barack Obama sold out to the austerity lobby in a February 23, 2009 speech quoted on pages 62-63. Kuttner notes several fallacies that Obama made: “Deficits did not cause the economic crisis. Confidence in economy has more to do with whether we are on a path to recovery than with whether we are on a path to reduce debt. The horizons of our children and grandchildren will be more a reflection of the health of the real economy than of the ratio of national debt to GDP (which, remember, was at record levels during the postwar boom, America’s greatest era of high growth and shared prosperity)” (63). “There is a better path to recovery and fiscal responsibility. The economy needs deficit-financed public outlay during the next few years, and then very gradual budgetary restraint as the recovery strengthens. Deficit-narrowing built on increased revenue collections that reflect an improved economy is far superior to budget balance that comes from belt-tightening” (68). Medicare’s cost inflation is mainly the consequence of the extreme inefficiency of the larger health system of which the program is a part. (Since 2000, Medicare’s inflation rate has been lower than that of the private parts of the system.) The fact is that nations with universal health insurance cover everyone for about 9 percent of GDP, while we spend nearly twice that—and leave tens of millions without insurance, even after the Obama reforms. As part 2 of this book suggests, Europe has been wrestling with austerity and its alternatives for a century. The excessive reparations imposed on Germany after World War I helped create a chronic debt crisis all over Europe and ultimately fed into the forces that produced the Great Depression and Hitler. After World War II, the policy of the victors was diametrically opposite. Though even more drastic reparations might have been justified by the far greater damage done by the Nazis, the victorious allies recognized that an economically healthy Germany was the best protection against a lapse back into fascism. The postwar recovery program included not just Marshall Plan aid but massive debt relief. This book was published in 2013, thus predicting the fascism of the supporters of Donald Trump. John Maynard Keynes, Kuttner tells us, pointed out in November 1918, that the fallacious argument that the Allied claims matched Germany’s capacity to pay, and that reparations should not impair Germany’s productive capacity (79), but opponents did not want to “let the Hun off.” The plan failed and led to the prominence of the hard-right, anti-German Tory party. “With our knowledge of Hitler’s rise to power, it seems preposterous that French and British leaders of 1918 and 1919 could have held such self-defeating views,” (81), but he deficit hawks are failures at learning from history (as well as deriding those who study history academically). “Speculators may do no harm as bubbles on a steady stream of enterprise,” wrote Keynes, “But the position is serious when enterprise becomes the bubble on a whirlpool of speculation,” (85) which is more like what we have today. “Currency instability rewards only speculators. These policies help the rentier class, at grave expense to the rest of society and to the productive potential of a real economy” (85). The goal was to punish the German people for a war prosecuted by a regime that no longer existed. A much needed work to demonstrate the dangerous consequences of some ill-conceived economic policies that are being formulated, nay foisted upon the helpless and the affected across the world under the ruse of 'austerity'. An unfortunate example is that of Greece. A nation that has been buffeted into virtual submission by both internal economic inefficiencies (to a good extent) and by insidious external policy diktats (to a significant extent) by the European nations headed by Germany. What Robe A much needed work to demonstrate the dangerous consequences of some ill-conceived economic policies that are being formulated, nay foisted upon the helpless and the affected across the world under the ruse of 'austerity'. An unfortunate example is that of Greece. A nation that has been buffeted into virtual submission by both internal economic inefficiencies (to a good extent) and by insidious external policy diktats (to a significant extent) by the European nations headed by Germany. Rampant financial speculation and the creation of exotic financial instruments by investment banks, hedge funds and unregulated/barely regulated hybrids led to incredulous amounts of leverage in the financial sector. During the so called ‘boom years’, these institutions were typically operating with leverage ratios of 30:1 and in some unbelievable instances, more than 50:1! A coalition of the so called deficit hawks of the likes of the billionaire investor Pete Peterson and his ilk engage in extensive lobbying and intense funding with a view to slash expenditure on social insurance and to direct the focus of the Government towards balancing budgets and cutting deficits. In a splendid Chapter titled “A Greek Tragedy”, Kuttner chronicles the devastating impact of austerity collectively thrust upon an already suffering Greek populace. Harsh and inexplicable measures imposed in exchange for financial aid, such as cutting pensions, introducing three new tiers of value added taxes, and slashing pay packages of the salaried classes ensured that the Greeks were saddled with the most deflationary package ever imposed on the member of the European Union. Unscrupulous brokers generating mortgages irrespective of the credit worthiness of the borrower, splicing and dicing of esoteric financial instruments with the covert blessings of credit rating agencies nursing conflicts of interests with the issuers of such instruments and a complicit, if not bewildered bunch of regulatory agencies all combined to create a domino effect that took the wind out of the sails of the global economy. Instead of aiding and assisting the hapless homeowners, Treasuries and Federal Reserve Banks on both sides of the Atlantic, came to the rescue of the very same greedy bunch of bankers responsible for triggering the very crisis which the world was trying to avoid, by mopping of trillions of dollars of toxic assets thereby recapitalizing and bailing out the ogres who were the creators of a dangerous specter. Even though a decade has passed since the Great Recession, we are still ransom to the murky and shadowy practices adopted by the so called “Too-Big-To-Fail” institutions. The systemic risks posed by them are very real and their penchant for leverage has only exacerbated an appetite for risk taking. Policy mavens will do well to read the prescriptive remedies being offered by Kuttner before it becomes too late to reign in a global catastrophe! Got the book through First Reads. 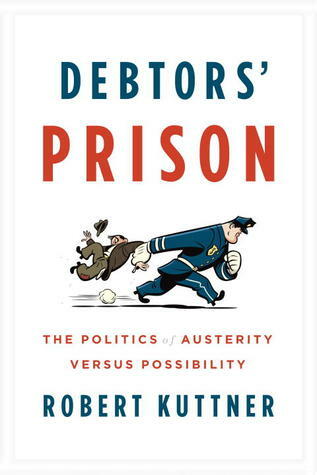 Robert Kuttner's "Debtors' Prison" was a great eye-opener about austerity and why it doesn't work. Thousands are taking to the streets now in Europe, Brazil, and Egypt to show that the people will not be suppressed. People have the power to take action, and Kuttner makes a great contribution, telling us that we must oppose austerity. It only works for a very small sliver of the population, and that's why only they are the ones peddling this prescription. Kuttner's explanation of the financial crisis of '08 is something most people understand. His book delves deeper into historic situations and the European Union's debt crisis (particularly in Greece) to show what does and does not work. He ends the book with a list of things we can do to prevent another crash. Of course, Americans are doing none of them. Great beginning and ending, and one that properly illustrates the downsides and limitations of austerity and the follies of the "cut ______ government program to the bone" kick that so many politicians are promoting. Gets only a 3-star rating, though, because the author could've gotten his points across - just as effectively - in about half the time. Read this book through Lone Star College's EBSCO Ebook Collection. Excellent book which offers concrete, workable solutions to our current economic problems. Unfortunately, with the exception of Senators Sherrod Brown, Elizabrth Warren, and Bernie Sanders, not many in Washington are listening. Definitely an interesting perspective, but I'm still wrapping my head around some of the points where I maintain a contrary viewpoint.